Informant America is determined to get at the truth of the story of Richard Wershe, Jr. who has been burdened with the street name White Boy Rick since he was a teenager. This week’s post includes an important correction to last week’s installment and a discussion of why it’s premature for Wershe’s supporters to get excited about a recent Michigan Supreme Court ruling on sentencing guidelines. This week’s blog post is a twofer; two topics. First, a correction to last week’s post. The previous post talked about Sam Curry, the cocaine importing partner of the late Art Derrick who was the wholesale supplier to the biggest names in the Detroit cocaine trade of the 80s. The blog mentioned he was the father of the notorious Curry Brothers, the ones Richard Wershe Jr. informed on for the FBI. It turns out there were TWO Sam Currys; both older black men, both in the drug trade, both operating on Detroit East Side during the same years and both named Sam Curry. The odds of that must be astronomical. The existence of the two Sams was pointed out by crime blogger Scott Burnstein and confirmed in an email from Rick himself. The Sam Curry who was Art Derrick’s partner as a wholesaler/importer of cocaine was not the Sam Curry who is the father of the Curry Brothers. In defense of this blog it should be noted some law enforcement guys from that era didn’t realize there were two Sam Currys, either. It’s important to get this stuff right and correct any reporting errors. The reason to be scrupulous with the facts is this blog is focused on debunking the legend of White Boy Rick which is based on lies, falsehoods and wild exaggerations. A big reason Rick Wershe is still in prison when contract murderers have been set free is because of his legendary status as a “drug lord” and “kingpin.” It’s not true. It never was. But the Michigan Parole Board and various state and local criminal justice agencies believe it because it’s never been seriously challenged, which is what Informant America is doing in installments each week. This Big Lie, initiated by some glory-hungry people in law enforcement and sensationalized by the Detroit media in the late 80s, has to be exposed. People with the power to do something about Rick Wershe’s continued imprisonment must be shown Rick Wershe has been kept in prison based on false information. There are plenty of lies that have been published about him. In order to dismantle the White Boy Rick legend this series of reports must adhere to facts and the truth. The role of informants in our criminal justice system is one of the most underreported yet critical elements in prosecutions. This blog will eventually report on other interesting informant cases from around the country but for now it is focused on exposing the false information about Richard Wershe, Jr.—aka—White Boy Rick. Some of Rick Wershe’s supporters got excited last week over reports the Michigan Supreme Court had struck down portions of Michigan’s sentencing guidelines as unconstitutional. One media story speculated on whether it could pave the way for Richard Wershe, Jr.’s release. Practically speaking, it’s hard to see how. In 1992 the Michigan Supreme Court struck down the drug law under which Rick Wershe was convicted. It was called the '650 law.' Anyone convicted of possession of more than 650 grams of cocaine or other illegal drugs automatically received a life sentence. It didn’t matter if the drug dealer was never involved in any violence. If they caught you with 650 grams or more, you were in for life. In laymen’s terms, the Michigan Supreme Court said in its 1992 ruling that this is contrary to the concept of letting the punishment fit the crime. So Rick Wershe, who never committed or ordered any acts of drug violence, who never operated crack houses, who never had a drug dealing organization or “crew”, who was never named in any conspiracy case, never charged with operating a Continuing Criminal Enterprise, otherwise known was the federal “kingpin” statute, was sent to prison for life. All of the other Michigan drug dealers convicted under the 650 law have been paroled. Not Rick Wershe. He’s haunted by the White Boy Rick legend. If there is a legal argument to be made for freeing Rick Wershe, Jr. it ought to be the 1992 Michigan Supreme Court ruling. Yet, the powers-that-be have refused to budge on a parole for the inmate known as White Boy Rick. Does this look like a "kingpin" who had ruthless, murderous inner city drug dealers following his orders? Some like to think Rick Wershe will be set free if Gov. Rick Snyder or some federal or local judge agrees with the legal implications of some higher court ruling such as the one last week. Uh huh. Sure. A few weeks ago Michigan's Gov. Snyder refused to reduce the sentence of a man named Saulo Montalvo who has done 20 years for being the getaway driver in a store robbery where the clerk was killed. Like Rick Wershe, Montalvo was a teen when the crime was committed. He was 16. Rick was arrested under the 650 law when he was 17 and sent to prison at age 18. Montalvo's bid for release by the Governor included a letter signed by a dozen of the murdered store clerk's relatives who said Montalvo deserved another chance. In Wershe’s case, even former FBI agents who know him have sent letters and testified to the Parole Board that he ought to be released. Their judgment has been ignored. Here is the reason the Montalvo story is worth noting: Gov. Snyder relied on the judgment and recommendations of the Michigan Parole Board in making his decision. The Associated Press reported, "...Snyder rejected the request for a shorter sentence after the Michigan parole board, which screens all cases, said a commutation had "no merit." Please think real hard about the previous sentence. 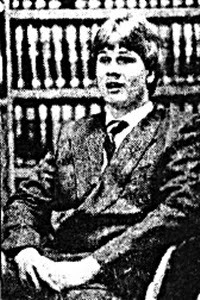 Any appeal to the governor in behalf of Rick Wershe is going to go right back to the Parole Board which has steadfastly refused any breaks for the prisoner known as White Boy Rick. At present there is no political or administrative mechanism for challenging the judgment of the Parole Board. There is no way to compel an investigation of the so-called facts the Parole Board is relying upon to decide Rick Wershe's fate. Ideally there should be a thorough independent investigation of the facts, the real facts, in the Rick Wershe case.Such an investigation should explore the accusation made here that the Parole Board received false information about inmate Wershe. This blog will prove, in great detail, the Michigan Parole Board has been deceived by some members of law enforcement who have opposed parole for Richard Wershe, Jr. as part of what appears to be a vendetta. This blog will prove law enforcement documents about Wershe that were given to the Parole Board contain false information and provable absurdities. That kind of exposure of the truth MUST be done if there is any hope of changing minds on the Parole Board. It’s a tough task but not impossible. It requires exposing two things: 1) the lies in the law enforcement documents purporting to show Wershe was a drug lord and 2) the irresponsible media frenzy that created the legend of White Boy Rick. Anyone who thinks the Parole Board has not been influenced by the media coverage of an inmate known as a "street icon" and "legend" is mistaken. Period. There’s a reason top-notch criminal defense attorneys worry and argue in court about pre-trial publicity. They KNOW the court of public opinion often matters as much as the courtrooms in the courthouses, even if judges pretend otherwise. Wershe is a man imprisoned by his reputation, which is false. The governor, the courts and the parole board are reluctant to let someone known as White Boy Rick go free. They tremble in fear there will be a public uproar; that they will be accused of being soft on crime. Better, in their minds, to play it safe, to keep a man in prison rather than face criticism from uninformed voters and taxpayers and their political opponents. They need what is known as political cover. They need proof Rick Wershe is not a menace to society and never was. If they can be shown conclusively that Richard Wershe, Jr.’s reputation as a “drug lord” and “kingpin” is without any substance, that it is a lie-turned-legend, they just might have the courage to finally bring justice to a great injustice. That’s why Informant America will continue to hammer away at exposing the truth about White Boy Rick. More next week.